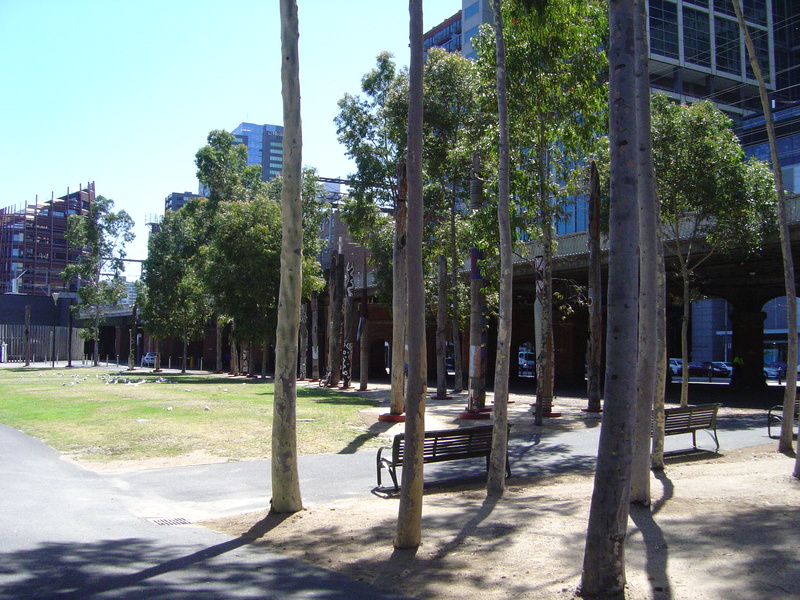 In my peripatetic study of Melbourne’s art this turned out to be an aboriginal art walk. 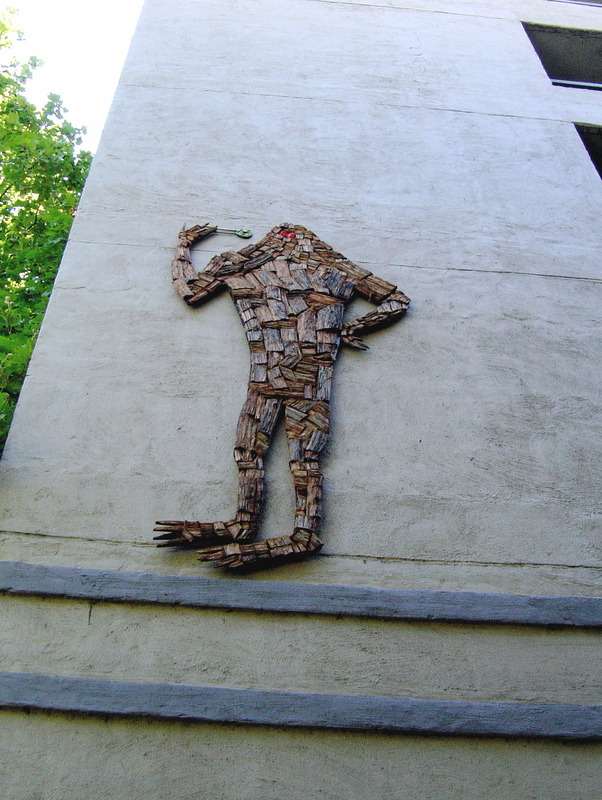 I walked down the neglected north bank of the Yarra River to Enterprize Park to see “Scar – A Stolen Vision”. I had seen the poles from the train many times before but I wanted to see them up close. Enterprize Park is in a small park area between two railway overpasses. The sculpture is well located the 30 recycled wooden pier posts transformed into giant fishing spears, funeral poles and history milestones. “Scar – A Stolen Vision” was produced by Kimba Thompson in 2001 with the artists Karen Casey, Craig Charles, Glenn Romanis, Maree Clarke, Ray Thomas, Ricardo Idagi and Treahna Hamm. It was first displayed in City Square in March 2001was relocated to Enterprize Park in 2003. The poles interpret the history of aboriginal life, from before colonialisation, to enduring the horrors of mission life and genocidal government policies. The title refers to the tradition of tree scaring, left by removing the bark for shields or canoes, as well as, to the healed tissue of a wound. 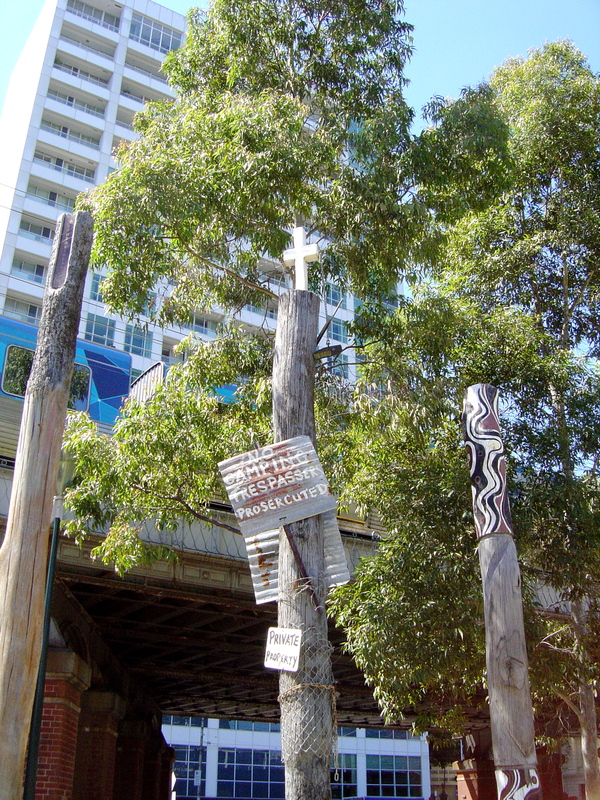 The posts fit in with the river gums and the pillars of the railway overpass. Trains, trams, skateboarders and tourists pass by the park that is occupied only by a flock of seagulls on the grass, a homeless man sleeping on a nearby bench and me. When I first saw it from across the street I though that it might be a new work by as street artist (Junky Projects sprang to mind) but on closer examination I saw that it was made of bark. 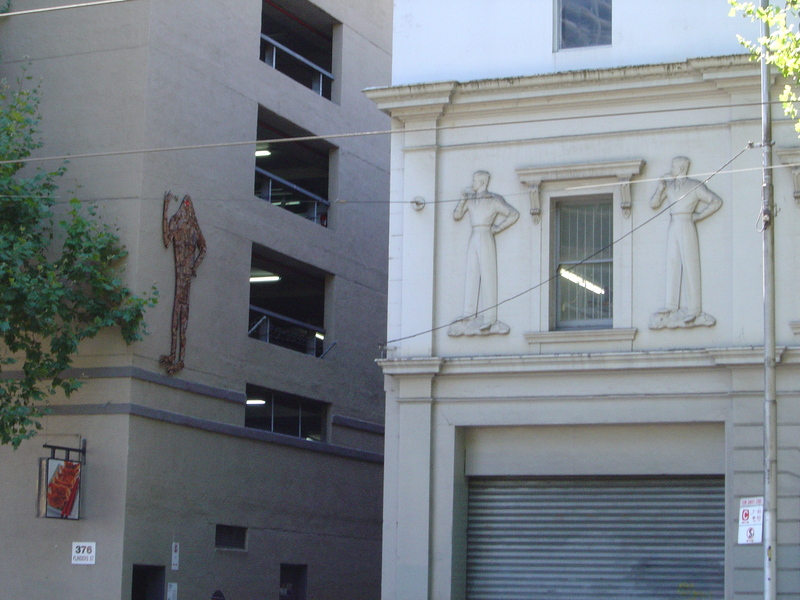 Now that I’ve found it I’m going to have to track down the other 5 who are hiding in various laneways around the city. I know that I walked past one in Flinders Lane later that afternoon but I didn’t see it. I was distracted by a couple of paparazzi photographing some tennis player who was doing some shopping. These Urban Doolagahl are elusive hard to spot creatures. Having walked up and down Flinders Street I decided to rest my wear legs, sit on a bench and feast my eyes on some of the central desert aboriginal art at the NGV in Federation Square. If I had want to continue the aboriginal art theme of my walk I could have gone further up stream on the north bank of the Yarra to Birrarung Marr. There I would have seen “Birrarung Wilam”, 2006 by Vicki Couzens, Lee Darroch and Treahna Hamm. And “Eel Trap”, 2003 by Fiona Clarke and Ken McKean, a plate-steel sculpture based on the form a traditional eel trap. This entry was posted on Friday, January 20th, 2012 at 9:12 PM	and tagged with aboriginal art, Flinders Street, Laneway Commissions, Melbourne and posted in Public Sculpture. You can follow any responses to this entry through the RSS 2.0 feed.